This Private Selection Lyeth bundles together so many facets of a good wine–it’s a special gift from dear friends, it tastes fantastic, and we appreciated the hell out of it. Originating from a quiet pocket of northern Sonoma County, this 2009 Cabernet Sauvignon comes at you silky smooth…it’s got an easy way about it that reminds you of a favorite Bordeaux and just engenders a great tasting experience. 2009 Lyeth Cabernet Sauvignon Private Selection, Sonoma, California, USA. Lyeth Estates was established some 30 years ago by a winemaker who purportedly aspired to the red blends of Bordeaux, and the 2009 Private Selection Cabernet Sauvignon is very much in this style. My unrefined palate can’t quite break down the profile of this wine, but its finish has less tannins than other Cabs I’ve sampled, and of course I wonder if the Private Selection adds splashes of Pinot Noir, Verdot, or perhaps Merlot to calm down the aftertaste. I think I get some blackberry in this deep, red beauty from the Alexander Valley, but it could be some other dark fruit and I really can’t be sure–except to say that it’s very enjoyable. There’s some spice aroma here too…not quite tobacco, vanilla, or some dominant earthiness, but something. You’ll have to taste it for yourself to hone in further. 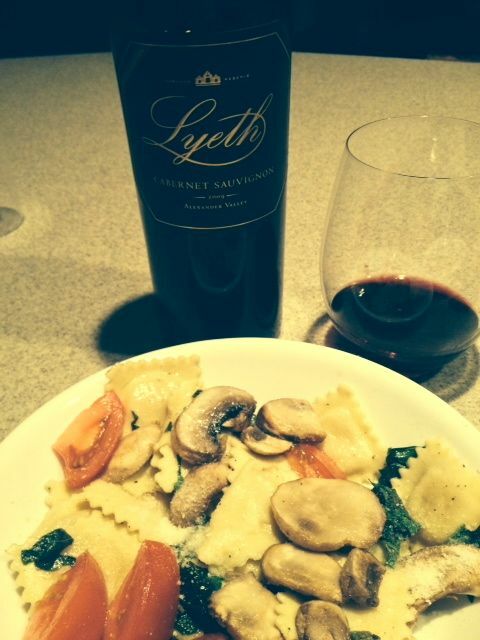 As far as the foodstuffs go, you can see that we paired up the 2009 Lyeth Cabernet Sauvignon Private Selection with ravioli, seasoned with olive oil, fresh basil, and tomato. Sort of a traditional combination but one that worked well for the two of us. So thank you, friends, for your generosity and your taste. We’ll see you soon and send our very best regards in the interim. This entry was posted in Cabernet Sauvignon, Red blend and tagged california winemaking, Sonoma, USA.